Mobile device security approach within an organization Organizations must respond to these challenges and to many others. Loss or theft of mobile devices as well as their use for non-business purposes are realities with which IT departments are constantly facing. Theft of SIM card encryption keys in the market. 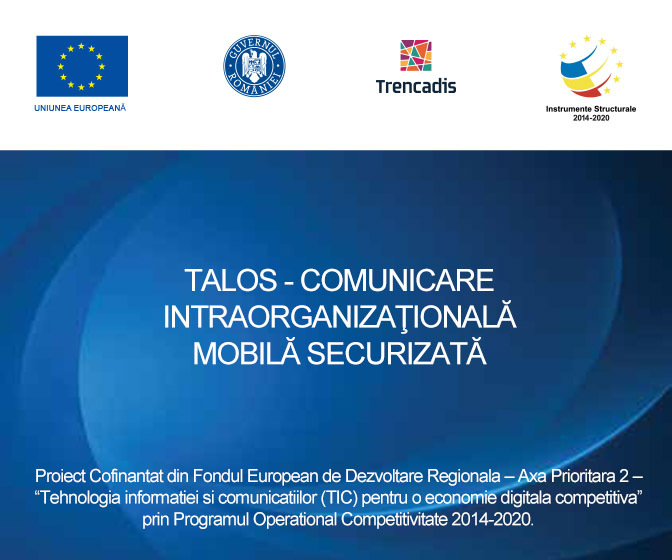 The development of an innovative secure messaging technology product for public and private actors in Romania, using high-confidential data. Close to home solution vendor for services. Basically, the result of this project provides integrated technological support for secure communication services in any organization that values the confidentiality of its data. This project is co-financed with funding from the European Regional Development Fund – Priority Axis 2 – “Information and Communication Technology (ICT) for a competitive digital economy”, through the Operational Competitiveness Program 2014-2020. The content of this material does not necessarily represent an official position of the European Union or the Government of Romania.